Providing architectural services for clients to engage in the realm of planning or construction, no matter the size or complexity. We strive to deliver clean and crisp designs and potential developments schemes for future generation to enjoy Our ‘tech' based atmosphere leaves us constantly looking into innovative technology and pushing boundaries. Here at Taylor & Co, we look to gain the best outcome for both yourself and the greater potential for the future. We develop schemes that cohere to the current planning policies, using inventive solutions to the ever present housing crisis. Not only do we provide residential options, but from a commercial aspect too. We advise you on the potential CIL (Community Infrastructure Levy) contributions, planning policies that may be imposed and provide scheme options right from the beginning. Every scheme provided is completely bespoke and site specific. Enquire today for more information. The National Planning Policy Framework is the ultimate planning policy guide to enhance the planning system. With the Framework being used across all local authorites, the protection of the environment with the ability for sustainable growth can be less complex and acheived. Community Infrastructre Levy (CIL) are a paid contribution towards the community of which you are intending to build within. It was introduces in 2008 to help support and encourage development in the community area. The charge works on a £ per meter square basis. Depending on which local authority, the charge amount can vary. One example in Biddenham the CIL charge is £125 per meter square. If you have any questions, feel free to ask us. We are a friendly team, who are willing to help. Have a plot of land and want to gain permission? Look no further! 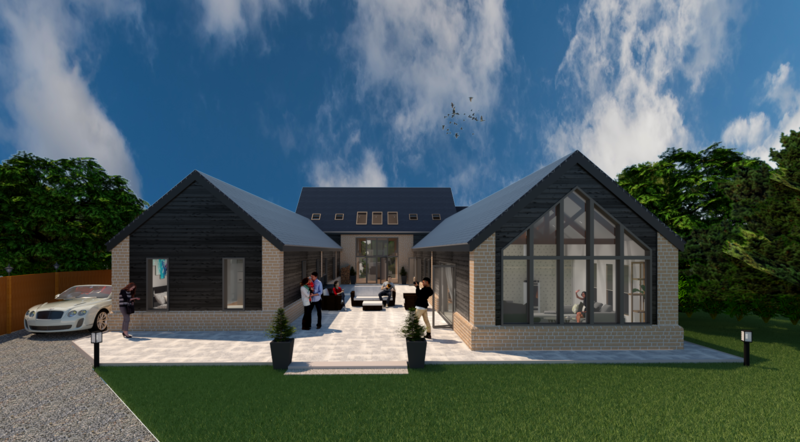 We can provide bespoke and innovative designs to suit both yourself and the council, in order to gain planning approval. Working closely with yourself, we are able to establish a detailed, bespoke design; which can then be submitted to the local authority on behalf of yourself. Alongside submitting your planning application, drawings such as site plans, floor plans, elevations and street scenes are required, to which Taylor & Co.’s friendly in house team can provide for you. We also liaise with the planning officer on your behalf to ensure a more successful application. Please note that there is never a guarantee of gaining planning approval, however, with our vast knowledge and expertise, we can ensure you are on the best path for a positive outcome. Taylor & Co. have recently invested in the CGI realm. We can provide both internal and external images to suit your needs. CGI can help to gain planning approval, by giving the planning authority a 3D representation of what the proposed building could look like. The images can also provide close details such as material choices and spacial awareness. Producing internal computer generated images of what your newly built house could look like has never been simpler. We can help sell the house with impressive imagery, to which you can use on any advertisement. Our in-house team are encouraged by your visions and include your personal touches within the image. Get involved today by contacting us. Have you got land or property that you would like to sell?